Myers does his usual good job with a tough topic. The book opens as an investigation of a school shooting ‘last April.’ Various adults (psychologist, police personnel) interview the two best friends of the shooter, Leonard Gray, to see whether they are connected to the ‘incident’ and to try to find out where all responsibility lies, including that of the school. Through the interviews, the reader gets into the minds of Cameron and Carla, both of whom are reserved about their victimization by bullies, particularly Brad and his jock friends. In details of the interviews, it becomes clear that both Carla and Cameron have lousy home lives although for entirely different reasons. They are each victims of different forms of abuse, and the needs of both are neglected. The reader understands through these interviews how they might befriend a guy like Leonard. And how both of them are just trying to get through being pegged as losers in the social milieu of high school. But what about the shooter? After killing his nemesis, Brad, and wounding others, Len commits suicide. He can’t be interviewed, but it is through Leonard’s own words, in the form of a hand-written journal, that the reader comes to some insight. His words are sometimes windows to his distorted ego and into his mental problems, but they also show that he, like his friends, has been abused. He has watched his father physically torment his mother while she just tries to forget and survive. So who is to blame in all this? The bully Brad? Len—did he act alone or did Cameron and Carla know what he was up to and agree to help him? As usual, Myers leaves it to you to sort the details. He won’t let you get away without thinking. Short, on-point in every moment—a can’t-put-it-down for all teens, including reluctant readers. Note: I’m going to feature bullying books (fiction and nonfiction) and, on the opposite end of the spectrum, books on inspirational people (biographies, memoir and fiction) for the 2013-14 school year. Shooter is on my list for next year’s book talks. 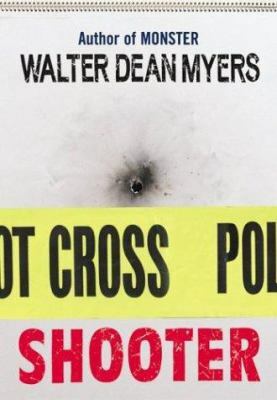 This entry was posted in Controversial Issue/Debate, Family Problems, Fiction, Hi-Low/Quick Read, Read 180, Young Adult Literature and tagged reluctant readers, school shootings, school violence, Walter Dean Myers, YA fiction, YA literature. Bookmark the permalink.